My photography notes, mostly from Swing Dance camps. These are just notes of my discoveries along the way, or trying to apply what I've seen or heard on the job or in various classes. I don't claim to be an expert or a pro or anything. You've been warned. It was a dark period in my photography. I wasn't really growing, and honestly, I got lazy. I found that when I went on vacation, it was just too much trouble to pack the camera. Also, remember with film, it was pretty expensive to have developed, so I might only take a couple rolls of 36-exposure film. I didn't have a flash, so I wouldn't shoot that much indoors. What I found was that those disposable cameras that were pretty popular back then (early 2000's) were "good enough" and were more convenient and less fragile for packing. But these cameras kind of made me stupid. >     is seen in the viewfinder. > Flash output is expressed in candela seconds. > approximately 250 candela seconds at full charge. 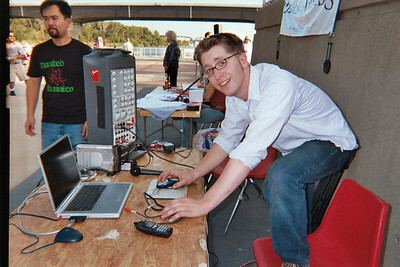 These are from Cowtown Jamborama 2003, taken with a disposable camera. Actually, I think the photos aren't really bad, but something I thought was funny was either the disposable camera or the scanning equipment caught the edge of the film on the far left of the image. I guess I could just crop that out.